Those cheeky monkeys are back in another installment of Ape Escape! This time though it’s up to you to wiggle that chubby couch potato body of yours in order to win the game! The game is played in the format of a game board with about 50 mini games that can be played in or out of the main game itself. 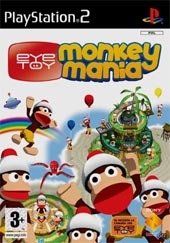 The nice thing about this title is that you actually have a lot of stuff to do in order to get through it all and the activities are varied which is great as some of the other eye toy titles in the past have gotten a bit repetitive. The colours and graphics are very bright and look good. The whole Ape Escape series is known for it’s quality so it was nice to see that things were not going to change this time around. You make your way through the board game and can spin the wheel to see how many squares you’ll travel. There are all the usual sorts of pitfalls and traps along the way that players will have to deal with. 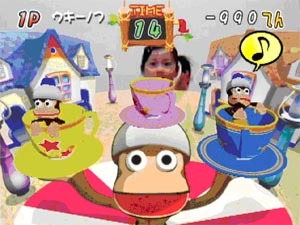 Unlike other games in the series, you have to befriend the monkeys this time. By completing the mini titles you will get more monkeys and the degree to how you win will depend on your final monkey tally J Monkeys are currency and whilst on the board on certain squares you will be able to get rid of your furry buddies and swap them for traps in the Shop in order to wreck the progress of your opponents. Did I have a favourite mini game? Yes I did. I enjoyed the Simian Stylist where you get to be a wacky hairdresser and do the monkeys hair in crazy fashion (they are wearing wigs – wigs!). Another game is Hide the Banana which despite anything you might be thinking is not a rude title. You simply feed your monkey in a classroom whilst the teacher’s back is turned. If you get caught you are going to get some chalk thrown at you for your trouble. Audio on the game is quirky and totally suited to the series. The monkeys make all sorts of funny noises and the amusement factor is high. 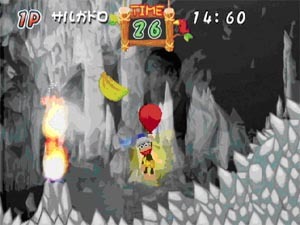 Unlike early Eyetoy games, you will easily be able to return to this one with a friend for future games. I didn’t find anything really to whine about with this title so can highly recommend it for a good piece of fun. For those of you who do not have a Eyetoy yet, you can get hooked up with one with a copy of the game.